Now, it’s a little odd to command people to be joyful. You can tell me to laugh and I can fake it, you can tell me to smile, but you can’t tell someone to be joyful. Joy isn’t on demand. Joy comes as a gift, it’s a surprise, Joy is grace. And I can’t think of a more appropriate word for us today. This day has come to me as a gift, as grace from God. My heart is full to be standing here today as your pastor. You know, we pray for God to make known God’s will and way, but you never how God is going to answer that prayer. You pray “Thy will be done”, and you never know how it’s going to unfold. As Presbyterians, we often use the phrase “if the way be clear;” we make all of our plans, and then say, “If the way be clear.” Which is a way of saying, if it’s God’s will. And when the way does clear, it is grace and joy. This moment of joy, of hope and expectation, is a gift. I want to take this opportunity to say two things quickly. First, and I know you know this, your PNC was awesome. Caitlin and I will never forget the first visit we had here with the PNC. They were awesome. The faithfulness and wisdom and love and joy with which they did their work was a powerful testimony to this church. Second, I want to thank you for being so kind to me and my family in the last few weeks as we have moved and begun to settle in. We have gotten so many emails and letters of support, and offers of help and well wishes. Every person we’ve met or talked to has been so kind and we have felt so welcome. To use the word of the day, we are so joyful, that today is here and we are beginning this journey! It’s be joyful Sunday! Faces pressed against the glass, watching to see what God is going do next. What a powerful Advent image. Advent is a season of anticipation, of expectation for what God is going to do in the future. Advent calls us to press our faces against the glass — not to see what God is going to do at Christmas, God has already done Christmas. But to see what God is going to do next, because of Christmas. Because of Jesus Christ, because God is in our midst with grace and love and power, because God is making all things new – what is God going to do next? I hope and pray we never lose that sense of holy anticipation. The prophet Zephaniah has his face against the glass, peering as prophets do into God’s future on behalf of God’s people. We picked up reading in chapter three, where the prophet calls us to be joyful. “Rejoice, Daughter Zion! Shout, Israel! Rejoice and exult with all your heart Daughter Jerusalem.” Zephaniah is inviting God’s people to a party; he’s telling them to crank up the music and raise the roof! Sing with all you’ve got! And this morning the call of the prophet echoes across the ages, this imperative comes to us with the force of the word of the Lord: sing! That’s the promise of Advent. A song for a weary world. That is the song that must be carried in the heart of God’s people, a hope and promise. That is the song that must be sung through God’s people, through you, to the weary world. Do we have a song to sing for a weary world? Do we have a song that will inspire despairing hearts and give courage to fearful people? Do we have a song to sing to a weary world? If we had started reading at chapter one of Zephaniah and read through the whole book, this call to be joyful would seem ridiculous. Like walking through a city in Syria or through San Bernadino, where people are hiding in fear, and shouting, “Rejoice!” Like walking into a hospital room, where the family has just been given the news, and saying: “It’s time to cheer up! Rejoice!” Joy doesn’t work that way; it’s not on demand. Joy is gift and grace. To understand the gift of joy that Zephaniah is proclaiming, we have to get a sense of the prophet’s whole message. If we only listen to half of chapter three, we’re taking such a thin and shallow slice. We must go back to chapters 1 and 2 of Zephaniah, some of the most damning and dooming texts in the Bible. The prophet begins with a sort of Genesis 1 gone bad: “I will wipe out everything from the earth, says the Lord. I will destroy humanity and the beasts; I will destroy the birds in the sky and the fish in the sea. I will make the wicked into a heap of ruins; I will eliminate humanity from the earth says the Lord.’ Destruction, and desolation and deep darkness. The God who speaks through Zephaniah is a God who has had enough. This is a God who has had enough of people chasing after other Gods, looking for a God that will be easier, or more convenient, or preferably a little more controllable. A God who will answer prayers a little more reliably. It is always tempting to find an easier God, and at this point the living God has had enough. This is a God who has had enough of leaders who bring violence and corruption on their own people. This is a God who has had enough of people who think there are no moral consequences; that whether you do good or evil, it doesn’t matter as long as you do well. This is a God who has had enough of priests who make religion an institution that serves itself; they take what was meant to be a gift of God and make it a burden. This is a God who has had enough of oppression and injustice and abuse. Zephaniah has his face pressed against the glass and tells us that God has had enough. You know, this Christmas season we pass one another in stores, or line up at stoplights, Christmas carols playing in the background, just living in our own thoughts and trying to be patient… It’s helpful to remember that we are in the midst of people who have had enough. A woman who has been trying to find a job since the recession, has rewritten the resume twenty times and worked every contact she knows, and nothing pans out. She has had enough. A couple has been trying to help their addicted child, they’ve been led up and down the roller coaster of rehab and relapse; their hearts are broken and they’ve had enough. A man realizes in mid-life that the dream he’s been chasing wasn’t really worth chasing after all and he’s had enough. We are always in the midst of people who have had enough, and often we have had enough. We have all had enough indiscriminate killing; we have had enough terrorist warfare; we have had enough fear and enough fear-mongering. We have had enough violence, and enough corruption, and enough pollution. We’ve had enough. And if we have had enough, imagine how a holy God feels. Zephaniah is writing about a God who has had enough. But more than what Zephaniah sees, I am drawn to what Zephaniah hears. With his face pressed against the glass, do you know what Zephaniah hears? He hears God singing. I never expected God to sing. Kind of like sneaking up on someone in the kitchen when they’re alone, and you just never took them for a singer. God the joyful singer. “The Lord will create calm with his love, he will rejoice over you with singing.” It is an image of tenderness and joy and peace. A parent who takes a screaming child in their arms, and rocks them back and forth, and sings until they are at peace. He will rejoice over you with singing. 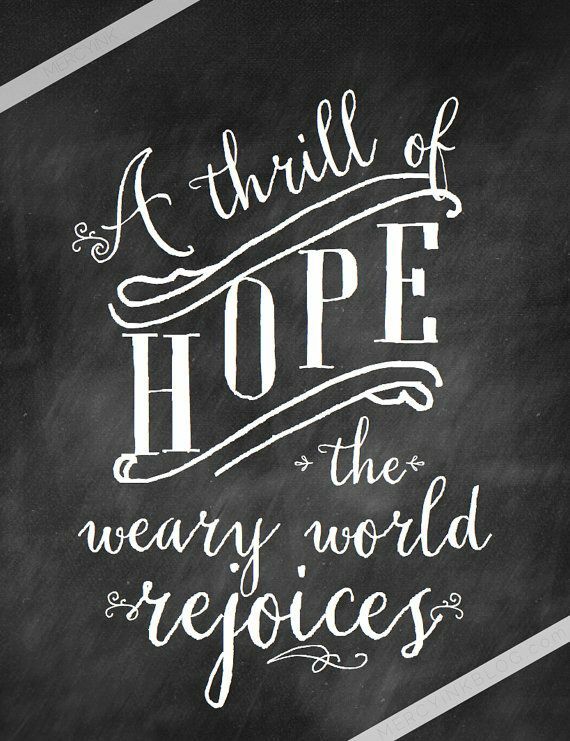 A thrill of hope, a weary world rejoices. This is the song for a weary world. Beyond the pain and injustice and heartache of the world in which he lived, Zephaniah heard God singing. He saw a glimpse of God’s future, of justice and peace, a glimpse of a future in which all are well and all are gathered home. Zephaniah saw God in their midst, and God was singing. I believe our call as the people of God is to stand with Zephaniah, face pressed against the glass to see what God is doing next. As we begin our journey together today, I believe our call is bear witness to the justice and mercy of God that is breaking into the world, and is breaking in through us. Our call is to hear God’s song, and to sing it with all we’ve got. The song is grace for a weary world. Joy to the world, the Lord is come. Let earth receive her king! Let every heart, prepare him room. And heaven and nature sing, and heaven and nature sing, and heaven and heaven and nature sing.